Place ingredients in blender except olive oil. While blender is on low, slowly pour olive oil into blender. Turn to medium, then high and blend for about 2 minutes. Dressing will thicken as it is blended and then chilled. Refrigerate. If separates, just whisk to combine. Makes about 2 cups of dressing. Will last in fridge for weeks! Make the Marinade. Set some aside for salad dressing. Place Chicken Breasts in a glass or plastic container and pour Home Dressing over chicken. Turn chicken to fully incorporate dressing. Cover and let sit for several hours or even better, overnight. 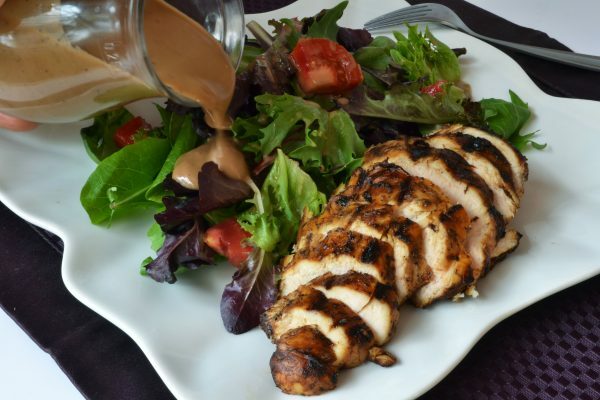 When ready to grill, lift chicken from dressing and cook according to your desired method (grilled, pan seared, or oven baked - I prefer grilled in a grill pan on the cooktop). Discard dressing that the chicken was marinating in. Salt and pepper or season chicken with your desired seasonings. Cook chicken until internal temperature reaches 165°F. Serve chicken hot or cold. Delicious!